Most American rappers have their teen years spent on the street and that was the case for Young Thug. He had a rough beginning as a child and was surrounded by the wrong set of people while growing up. The juvenile center was one of his regular stops in his younger days. With all the troubles he had, who would have imagined that he would emerge as one of the most influential rappers of all time. He started quite late in his career and ever since 2013 when he rose to stardom, he has worked with a lot of popular rappers like Kanye West, Nicki Minaj, Birdman, T.I to mention a few. Of a truth, he has walked his way up the success ladder despite his rough beginnings. Here is everything you should know about him. Young Thug’s life has been filled with ups and downs right from his days as a child. He was born as the tenth child out of eleven children to a family which was frequently involved in one criminal act or the other. His life couldn’t have been any better as a kid because he had the worst influence around him. So in order to feel secure and safe, he developed strength as a violent kid. Of a truth, he had a loving family but had to survive on the streets of Atlanta where he was born. At birth, the musician was named Jeffrey Lamar Williams on August 16, 1991. He had the opportunity to attend school despite his family member’s waywardness but he misused it as he was sent to juvenile prison after he broke his teacher’s arm while at high school. Jeffrey started out as a musician in 2011, where he recorded a series of mixtapes. With his mixtape, he gained attention from Gucci Mane who later signed him up with the 1017 Brick Squad Records in 2013. That year, he rose to stardom after he released his first project. Ever since then, he has released a few other musical gigs and has also topped his way up the success ladder. To his credit, the rapper has commercial mixtapes like Barter 6 (2015), I’m Up (2016), Jeffery (2016), Beautiful Thugger Girls (2017) and Super Slimey (2017) which he collaborated in with co-rapper Future. The musician has also won a couple of awards for some of the works he has done so far. Notably, Young Thug won the 2017 MTV Video Music Award in Best Editing for his work “Wyclef Jean” and also Video of the Year for his other work “Havana” (with Camila Cabello). He has equally won for the same song; American Music Awards in the category of Collaboration of the Year, Video of the Year and Favorite Song – Pop/Rock. Is He Gay or in a Relationship? Speculations about Young Thug’s sexual orientation have been ongoing for a while, a few have considered him gay while others say he has a straight sexual orientation. We wouldn’t put blames on anyone who agrees to the fact that he is gay, often times, the rapper is seen in women clothing. His love for these dresses is so weird, he wears every style of them. 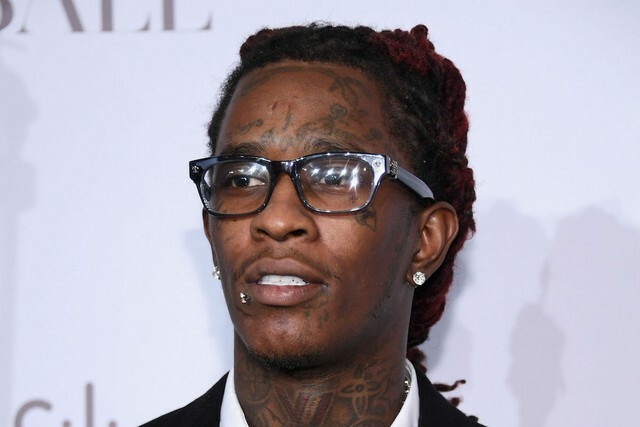 Just a few weeks after the rumor began, Young Thug shocked the world when he publicly announced that he was a homosexual despite been affianced to Jerrika Karlae at the time. No one knows how true his public statement was but we would say it was just his means of controlling the rumor. Well, for AnswersAfrica, we know that Young Tug has been in a relationship with his longtime girlfriend Jerrika Karlae. The two met at Gucci Mane’s Studio but didn’t start up their relationship immediately because the lady wasn’t ready for love just yet. After a few months of their friendship, they decided to take a step further. Currently, the two are said to be engaged but are currently having relationship issues. Young Thug has made an enormous wealth from his career as a musician, nevertheless, his earnings are not limited to being a musician. As an Avant grande fashionista, he has worked with a few fashion lines including the likes of Calvin Kevin. He has also topped his incomes with his deals on social media platforms, his videos on Youtube and Instagram is said to have over a million views plus the little stipends he makes from his fashion line. Although his estimated net worth of $3million is less expected of him, we do see reasons why he may not have exceeded that level. Records have it that he occasionally pays his lawyers to help him with his legal issues and he spends much on child support for his six children. Body Measurements and Features: He has a slim body build, stands at 6 feet 3 inches and weighs 76kg. The rapper measures 42 – 32 – 13 inches for his chest, waist, and bicep respectively. Young Thug is a lover of tattoos, he has a number of them, both on his face and other of his body parts. Often times he is seen wearing a dread and has a lot of piercings. Children: The rapper has six children from four different women, his first kid was born when he was 14 years old. He barely talks about his kids. Teeth: Young Tug didn’t have the best set of teeth while growing up so he developed low self-esteem because they were discolored. Often times, he covers his mouth with his hands while talking. However, he has worked on them and is currently said to have one of the best set of teeth. Siblings: Everyone knows that the rapper has ten other siblings, however, only a few know that he has just one true sister amongst them and the rest are children from his mother’s previous marriages.